Current advisories from the National Weather Service. Incredible photos and video there, and it's all 100% real. Furthermore, this round of wet weather isn't over yet. We're already seeing spotty pockets of rain throughout the southern half of the state Monday morning. 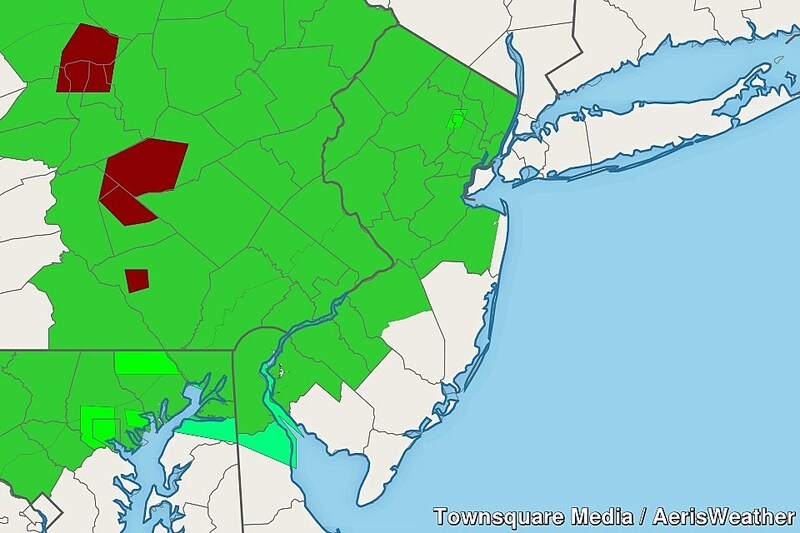 Scattered showers and thunderstorms will impact New Jersey throughout your Monday. It looks like the strongest storms and heaviest rain will occur from Monday mid-afternoon to evening (3 p.m. to 9 p.m.) In the meantime, it will be a mostly cloudy and fairly humid day, with high temperatures ranging from the mid 70s (North Jersey) to mid 80s (South Jersey). Because of the likelihood of torrential downpours, combined with a saturated ground and swollen waterways, there will be an increased risk of flash flooding once again Monday. A Flash Flood Watch is in effect until Midnight for most of New Jersey: Bergen, northwestern Burlington, Camden, Essex, Gloucester, Hudson, Hunterdon, Mercer, Middlesex, inland Monmouth, Morris, Passaic, Salem, Somerset, Sussex, Union, and Warren counties. Will the flooding be as bad as Saturday? I obviously can't say for sure, but the ingredients are there for slow-moving areas of heavy rain. For the rest of the state, flash flood guidance is forecast to remain just below the watch threshold, but it's still a marginal concern: Atlantic, southeastern Burlington, Cape May, Cumberland, coastal Monmouth, and Ocean counties. I have to leave a few more showers and storms in the forecast for Monday night, along with the possibility for some patchy fog (where the ground is wet). Low temperatures should fall to about 70 degrees overnight. One more unsettled day is expected Tuesday, with two potential rounds of rain. The first piece looks to drag scattered showers through North Jersey Tuesday morning. A more widespread round of drenching thunderstorms is forecast to sweep across New Jersey from Tuesday late afternoon through evening (5 p.m. through 11 p.m.) As the main storm system (a low pressure system well north of NJ) rotates out to sea, we should see clearing skies and more comfortable weather conditions Tuesday night. If you're looking for a solid beach day this week, Wednesday is a good bet. The day looks completely dry, with a period of solid sunshine through the middle of the day. Temperatures will be on the hot side of normal, with most highs within a few degrees of 90. Thursday looks summery too. I'm maintaining a dry forecast for now, with partly sunny skies and high temps in the lower to mid 90s away from the coast. Our next storm system comes into view Friday. While a few showers will be possible in the morning, the better chance for rain and storms will come late-day. That could set us up for a halfway decent weekend — although I know better than to attempt a confident weekend forecast this far in advance.